The purpose of this circuit is to prevent the engine from stalling while driving in lock–up condition, when brakes are suddenly applied. When the brake pedal is depressed, this switch sends a signals to the ecm. Then the ecm cancels the operation of the lock–up clutch while braking is in progress. The circuit prevents the engine from stopping when the vehicle is stopped by sudden braking when the torque converter clutch is in the ”lock–up” mode. The ecm receives the signal from the stop light switch at the time brake pedal is depressed. Then, the ecm sends the signal to the lock–up solenoid valve not to be in lock–up condition. 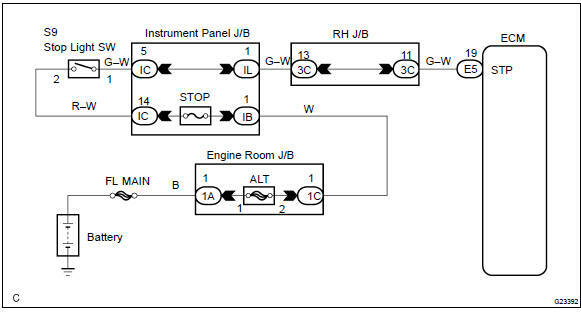 When the stop light switch remains on during ”stop and go” driving, the ecm interprets this as a fault in the stop light switch and the mil comes on. The vehicle must stop and go (3 km/h (2 mph) to 30 km/h (19 mph)) ten times for two driving cycles in order to detect malfunction.